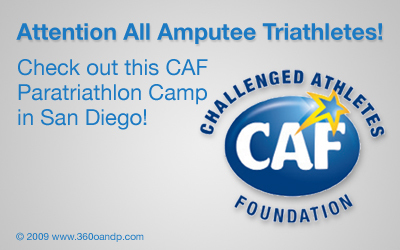 CAF is looking for 3-4 adult amputee triathletes who may be interested in attending an awesome Paratriathlon Camp August 19-22 in the San Diego area with outstanding triathlon coaches from Multisports.com. 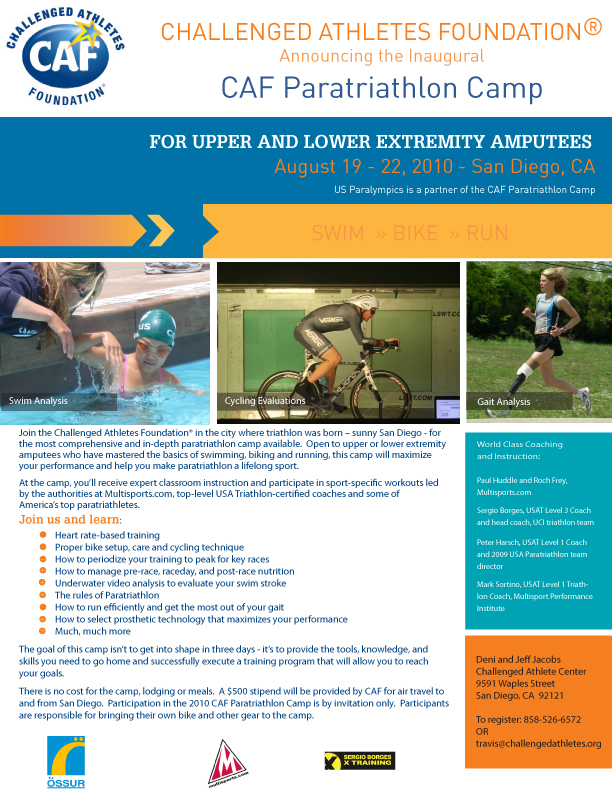 The camp is open to upper or lower extremity amputees who do not need to be advanced triathletes, but who have mastered the basics of swimming, biking and running. If you or anyone you know is an amputee triathlete (even a relative beginner) and would like to attend this free training camp, please review the details on the attached flyer and contact CAF as instructed. If invited to attend, CAF will cover food, lodging, ground transportation and up to $500 for air fare, and show you a great time. Space is limited to 25, and there are 19 registered as of today, so don’t hesitate if interested. We would greatly appreciate it if you would circulate this to others who may be interested in this opportunity. Thanks! VP-Mktg, Adam Smith Enterprises, Inc.